Jochen signed from German side SV Waldhof Mannheim. He was soon demoted to the reserves and, following an injury in November 1991, he was forced to quit the game. Jochen was born on this date in Erbach, Germany. The opening match of the season produced an explosive start with new signing Jochem Muller making his debut. There was almost a sensational start for the German newcomer when Bonner managed to pluck his header out from under the bar. However, it was Celtic who drew first blood in what was to develop into a quite fascinating contest. Charlie Nicholas headed Celtic ahead from close in after only nine minutes. There was a further set-back for us when Tommy Coyne took a return pass from Charlie Nicholas and blasted home a second from just inside the box after 17 minutes. However, a controversial penalty award ten minutes later brought us back into contention. Referee Brian McGinlay spotted Duncan Ferguson being held and after Bonner had been booked Michael O'Neillstepped up to hammer the spot-kick high into the net. Thereafter we enjoyed our best spell of the game to date only for Celtic to grab an unexpected third when John Collins lofted drive from 25 yards went in via the underside of the bar. 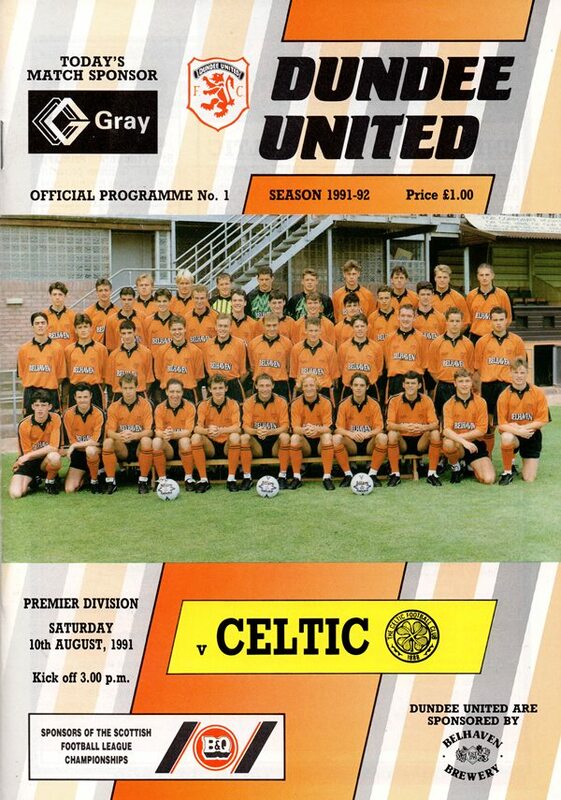 This was supposedly a summer's day, but the haar which enshrouded Tannadice made it more like November and the Tannadice floodlights were on from the start. Injuries once more upset team selection. Dave Narey and new signing Walter Rojas, both failed fitness tests on the morning of the match, so we made only one change to the starting eleven which defeated Falkirk in midweek — Alex Cleland coming in for Dave Narey.